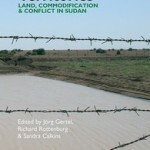 A new book edited by Jörg Gertel, Richard Rottenburg and Sandra Calkins seeks to disentangle the emerging relationships between people and land in Sudan. The first part of the book focuses on the spatial impact of resource-extracting economies while the second part presents detailed ethnographic case studies. These show how rural people experience “their” land vis-à-vis the latest wave of privatization and commercialization of land rights. For further details and an offer for the book please read attached PDF file. This entry was posted in Books on July 7, 2014 by admin.